Abuja — President Muhammadu Buhari has said he is not bothered by the defections in the ruling All Progressives Congress (APC). Responding to a question during an interactive session with the Nigerian community in Togo at the Nigerian Embassy, Lome, Sunday night, President Buhari said most Nigerians appreciated the performance of his administration. "I am not bothered about the defections. Ordinary Nigerians have developed confidence in us and are defending us. I assure you, majority of Nigerians back home are appreciative of our efforts." Buhari, who expressed delight in seeing the Nigerians who had travelled from the five regions of Togo to welcome him in Lome, said he was pleased to hear them commend the performance of his administration. A statement by Senior Special Assistant on Media and Publicity, Garba Shehu, said the President assured the Nigerians in Togo that his administration had remained steadfast in keeping to its three campaign promises of providing security, improving the economy and fighting corruption. Buhari said if past governments had utilised even 25 per cent of the huge oil revenue available to them, Nigerians would not be complaining today, citing the $16 billion reportedly spent on electricity and yet Nigerians could not see it. He assured of his administration's commitment to providing critical infrastructure and loans to farmers thereby cutting rice importation by more than 90 per cent. President Buhari said all recovered illegally acquired assets would now be sold and the money paid into the treasury in the administration's renewed anti-graft campaign. "I assure you that we are making progress in security as some displaced farmers are returning to their farms. We will continue to work very hard for our dear country," he stressed. In his welcome address, the Nigerian Ambassador to Togo, Joseph Olusola Iji, said the close to 2 million Nigerians in the country were law-abiding and peaceful even as he drew attention to the inability of the Nigerian Mission in Lome to issue Nigerian passports, making applicants to go to Ghana or Benin Republic. While representatives of top bank executives commended the economic policies of the Federal Government, especially the Ease of Doing Business, agricultural revolution and anti-corruption campaign, various leaders of the Nigerian community also lauded the discipline, transparency and accountability that the current administration has introduced into governance. They called for Federal Government's assistance towards completion of the community's ongoing school building project in order to overcome what they described as lack of good English schools in that country. 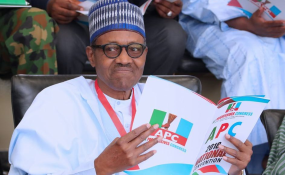 The Togo chapter of APC told President Buhari not to be worried about the defections from the party, assuring him of its support in the 2019 presidential election. The governors of Cross River and Niger states; ministers of Foreign Affairs, Defence and Interior; Minister of State, Industry, Trade and Investment; National Security Adviser; Chief of Defence Staff; Director-General, National Intelligence Agency; and the governor of the Central Bank of Nigeria were among top government officials who accompanied the President to his first official engagement on arrival in Lome ahead of the Joint ECOWAS/ECCAS Summit, and the 53rd Ordinary Session of the ECOWAS Authority of Heads of State and Government, among others.